Last year, I had the chance to share with you a fantastic book called, 'Dark Hope'. Though this was actually a young adult fiction, I-as a 20 something year old mom- found myself being drawn into this world of mystery, angels and human trafficking. I loved it, and couldn't wait to find out what happened next. In fact, in my previous review, I stated that the worst part of the book WAS the ending, because it truly left you hanging, waiting for more. The second book in the Archangel Prophecies- Dark Rising- has arrived!! 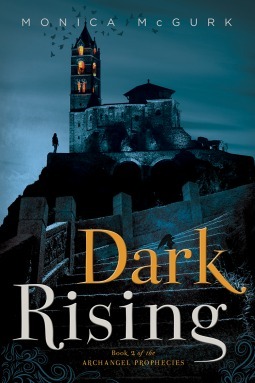 The epic narrative introduced in Dark Hope continues in Dark Rising as Hope crisscrosses some of the most ancient sites in Europe and plumbs the depths of history in search of the truth about the Key, herself, and love. Exploring themes of identity, fate, jealousy, trust, and forgiveness, Dark Rising’s mythological scope and moral urgency deepen as we come to understand the choices and consequences faced by a young woman determined to follow her heart and chart her own destiny.About the Author: Monica McGurk started out writing fan fiction based on Stephenie Meyer's Twilight Series under the pen name Consultant by Day. She has been recognized for her prequels and alternate versions by her fans, winning the Twific Fandom "Undiscovered Gem" award for Morning Star in 2013. Since her fan fiction days, she has left the consulting firm at which she was a senior partner and remains a full-time business executive based in Atlanta. While this is her first novel of any sort, she has been published in the business press on numerous topics.She is married and the mother of three children, for whom she creates elaborate bedtime stories that sometimes last for over a year. She has already completed her sequel to Dark Hope, which she hopes to publish soon. This fantastic follow up continues right where the first book took off, so while there is some recapping of previous events, I do highly recommend reading book one first! If however you are like me and have already finished Dark Hope and found yourself waiting, you will not be disappointed! This is truly a wonderful follow up filled with more mystery, more drama and more romance. Though I have not yet made it to the end, I am already loving what I've read so far! If you- or the young adult in your life- enjoy a little supernatural fiction, this is one you do not want to miss! I love young adult books!! I may not be a young adult but they are such good and easy reads!! This one sounds great and like one I can't wait to check out!! Totally adding to my must read list!! Sounds like a fun book. Your recommendations are filling my "to read" list! Awesome! My TBR list just keeps growing. Going to put the first book book the series on it and go from there!